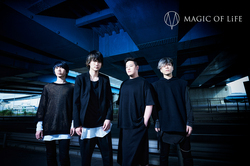 MAGIC OF LiFE is a melodic rock band known for the credit songs from the popular anime Yowamushi Pedal and Joker Game. The band formed in 2003 under the name DIRTY OLD MEN, and formally changed their name to MAGIC OF LiFE in 2014. With stunning vocals and catchy riffs, MAGIC OF LiFE has performed at festivals such as hide presents MIXED LEMONed JELLY 2016, Inazuma Rock Festival, Anime Jam, Countdown Japan, and Rock in Japan. Their music has also been featured as theme songs for multiple Japanese network TV shows. MAGIC OF LiFE has a whopping 7 full studio albums under their belt, in addition to multiple singles and mini albums.